Entertaining mentalism from the laughable to the incredible. Easy? For the beginner - No! For one who knows the basics, these 24 exciting effects can be learned quickly with just a few practice sessions - and just a few props. Effective? Famous mentalists and magicians from around the world would say - Yes! This book is already in the libraries of Jay Marshall, Max Maven, Larry Becker, Bascom Jones, Richard Mark, T. A. Waters, Micky Hades, Basil Horowitz, Ted Lesley, Phil Willmarth and many, many others. Entertaining? Thousands of audience members have proven it to be so with their gasps, laughter and applause - as well as with their referrals and requests for repeat performances. You can't go wrong with this book - and that's no fraud! When this first came out in print I was in two minds to purchase it is now out of print. So grateful that it is now available here for $10. One copy was recently on Ebay at $35.99 and $13.10 postage which I missed out on and I only wanted to learn just one of the 24 original when first the book came out in print. But now have read today without moving from my computer screen I find that all the effects can be used or altered to suit my own style which I am sure any one purchasing and studying and putting some hard study and practice in too they should find the cost of the book has paid for itself with just one chosen effect. 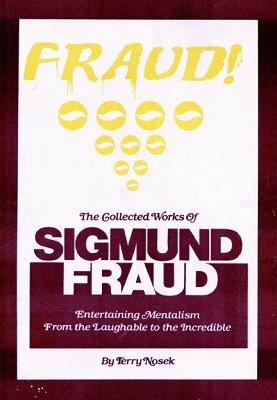 A recommended addition to any mentalists working lybrary.